When I first started making cranberry sauce for Thanksgiving, I became addicted to it. It’s such a simple process (I basically just make a cranberry jam), and it tastes good on everything around the holidays. It’s sweet but tart and has the deliciously deep taste of cranberry. So I’m always trying to incorporate it into other dishes instead of just eating it as a turkey condiment. And since I like to sweeten a lot of my vinaigrettes with honey, I thought why not use a little cranberry sauce instead. I start by cooking fresh cranberries down with both brown and white sugar, as well as some lemon juice. Once thick and jam-like, I cool the mixture down before using it in the vinaigrette. It’s combined with a variety of flavors – white wine vinegar, grapefruit juice, and Dijon mustard being the ones that standout. Once the vinaigrette is emulsified, I add oregano for a fresh, herby finish. One important rule with vinaigrettes: season well! It allows the rest of the flavors to come through. I would start with the amount of salt and pepper listed in the recipe, but feel free to add more to your liking. The salt will especially bring out the sweetness in the cranberries, while the pepper gives the contrasting spicy bite. 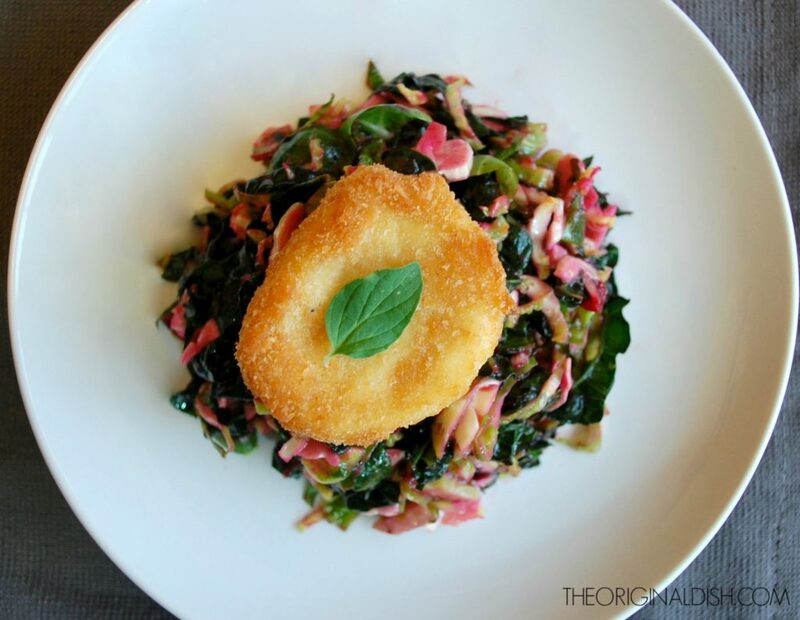 Since the vinaigrette is fairly thick, I didn’t want to weigh down delicate greens with it. So I use hardy kale as the base of the slaw. I also add some thinly sliced Brussels sprouts because I always find myself wanting to eat them around this time of year. They also add a nice crunch. These vegetables are simply tossed with the vinaigrette, easy as that. By marinating the slaw, all of the kale and Brussels sprouts’ bitterness dissolves and the sweet, citrusy vinaigrette infuses the entire mixture. 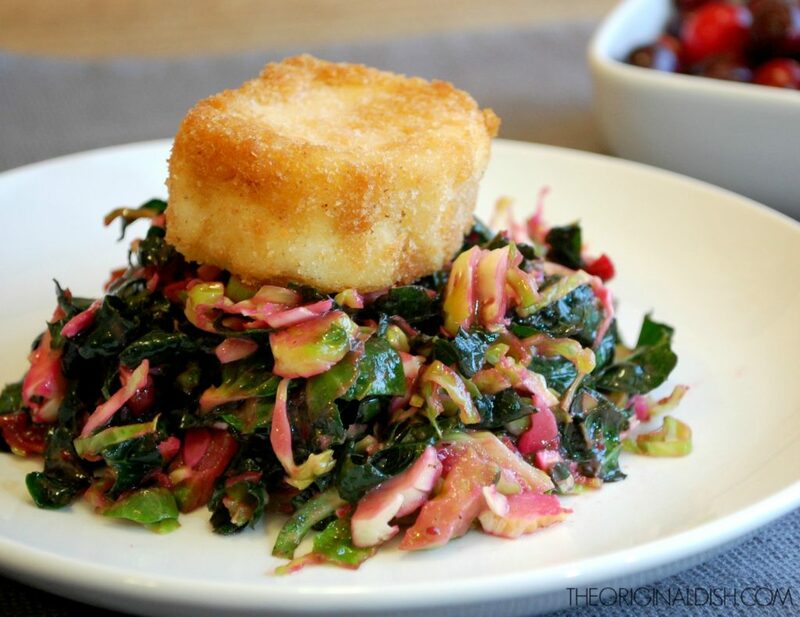 Now, if you want to lighten up a meal or two during the indulgent holiday season, eat the kale slaw as is (or maybe even with some crumbled goat cheese on top). 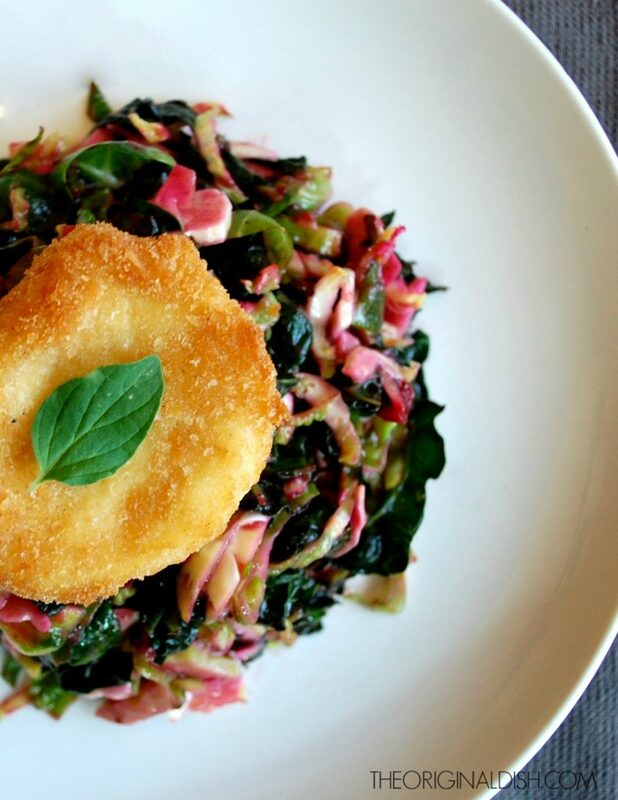 But I add one finishing touch: FRIED goat cheese. The tangy goat cheese compliments the sweet vinaigrette perfectly. And being fried…well, that just makes anything taste good. I create a dredging station simply with flour, seasoned egg, and seasoned breadcrumbs. 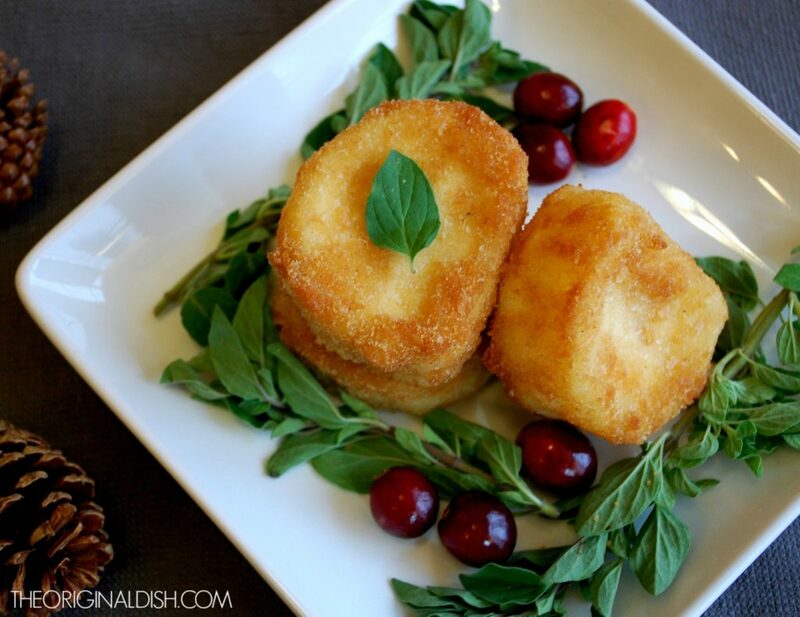 The goat cheese rounds are coated and then fried until golden brown and beautiful on each side. I make sure that there is a good amount of oil in the pan so that the sides of the goat cheese get cooked as well. 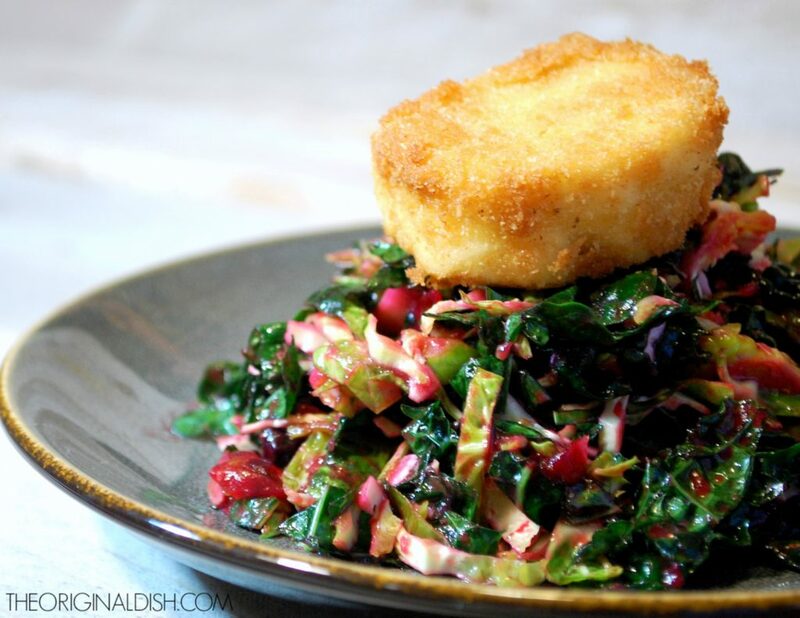 I like to serve the whole round of fried goat cheese on top of the slaw and then break off smaller pieces for each bite. In a small saucepan, combine the cranberries, brown sugar, granulated sugar, and lemon juice. Over medium heat, cook until the bubbling and the cranberries begin to burst. Reduce the heat to low and continue to cook until thick and homogenous, about 15 minutes longer. Remove the cranberry mixture from the pan and let cool. 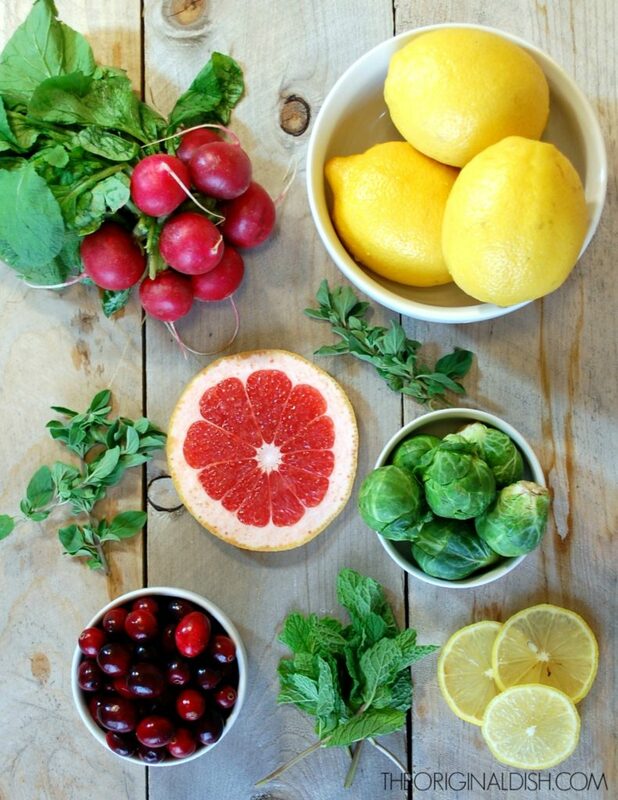 Whisk together the white wine vinegar, grapefruit juice, lemon juice, lemon zest, Dijon mustard, and cooled cranberry mixture in a large mixing bowl. Slowly drizzle in the oil, whisking continuously until emulsified. Stir in the oregano and season with the salt and pepper. Add the chiffonade kale and the sliced Brussels sprouts to the vinaigrette. Toss well to combine. Let the slaw marinade for at least 30 minutes in the refrigerator. Serve cold or room temperature. Create a dredging station using 3 separate mixing bowls – one for the flour, one for the lightly beaten eggs, and one for the breadcrumbs. Season the eggs and breadcrumbs with salt and pepper. (Make sure the goat cheese is cold so it slices easily and doesn’t melt immediately when fried.) Using a piece of dental floss (it works best), slice the goat cheese into ½-inch rounds. Pass each round through the dredging station, first coating in flour, then egg, and finally breadcrumbs. Make sure you pack the breadcrumbs firmly into each side of the round so they stick. Set the rounds on a sheet rack until all of them are dredged. In a 10-inch sauté pan, heat the oil over high heat. Working in batches, place the rounds in the hot oil so it sizzles. Reduce the heat to medium and cook until golden brown, only about 1-2 minutes per side. Watch the goat cheese closely…you don’t want it to melt into the oil. Transfer the rounds to a paper towel lined plate. Repeat this process until all of the rounds are cooked. Serve warm. 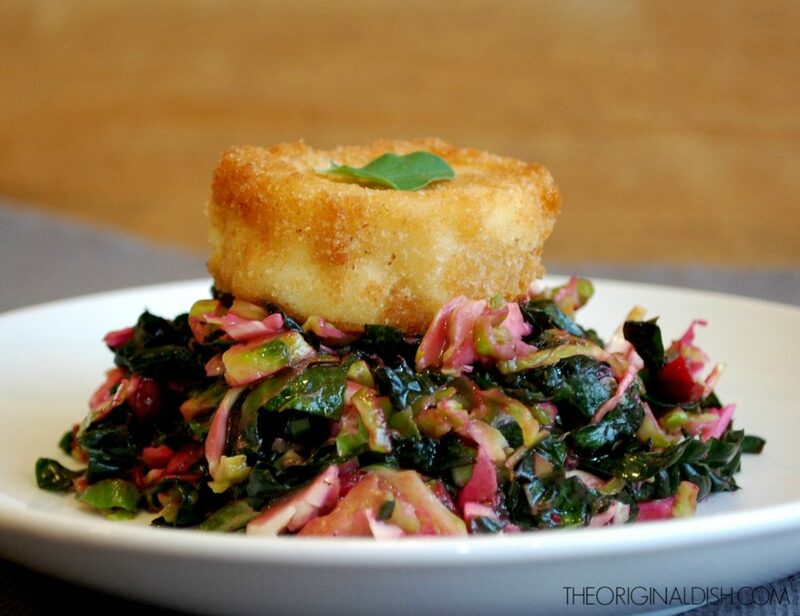 Pile a heaping amount of kale slaw onto a plate and top with a slice of fried goat cheese. Garnish with a leaf of oregano. For the kale, first wash it well and let dry. Strip the leaves away from the stem by holding the bottom end with one hand and sliding your hand down the stem with the other. When all of the stems are removed, take a handful and roll them up lengthwise, making a long bundle. Run your knife through the bundle lengthwise, creating thin strips of kale leaves. For the Brussels sprouts, first remove each end. Cut each in half lengthwise and slice horizontally through each half as thinly as possible, creating shaves a Brussels sprouts. Another winner. Posted on my Pinterest and FB. Love it, I will do this right a.s.a.p.